So much has happened since I last wrote that it’s hard to decide where to begin. First the “lowlights”. Yesterday (Tuesday) evening I finally got seasick. Yes, even chief scientists get seasick. The waves had increased even more, and they were approaching the ship such that we were making a very uncomfortable corkscrew motion. I “hit the rack” for about 8 hours and I’m feeling much better now. Now the highlights! Before seasickness got me, in the early morning hours of the 25th, we pushed over the mooring anchor. That was the final step after a harrowing night of mooring operations that began at about 11 PM on the 24th. 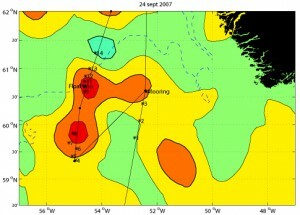 As we approached the mooring location on the 24th, the weather forecast didn’t look good. But it was looking even worse for the couple of days following. So with the captain and “deck boss” Will Ostrom, I agreed that we should do the mooring during the night. 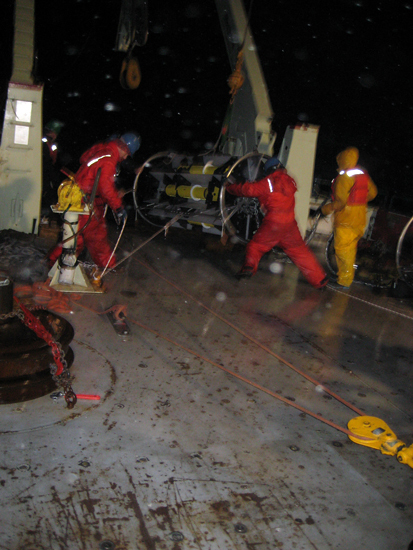 Working on a pitching deck at night is not ideal—although lighting is very good, it’s hard to see the big waves coming at the ship and thus hard to anticipate how the ship will move next. All night the technicians and crewmembers worked very hard to gingerly slip each piece of gear into the water without damage to the gear or themselves! All night it was cold, windy and raining. Kate and I stood watching and writing down the time that each piece of equipment went over the stern. My feet would go numb with cold after standing around for a while, so I went inside to warm up briefly. I didn’t want to miss a minute though. This was the big moment after years of planning for this mooring deployment. Finally in the wee hours of the 25th, the last current meter went over the side, followed shortly by the “big splash” of the anchor. Will, Jim and I stayed up a bit longer to make sure the mooring “settled” (it takes about half an hour for the anchor to reach the sea floor—that shows how deep the ocean is here (3000 meters)). After that, we were off to find an eddy. We held back one float from the mooring so that we could launch it by hand inside an existing eddy. I instructed the mate on watch to go to the first location where an eddy might be, then hit the rack. It would be at least 12 hours before we got there. The weather was even worse when I woke up on the afternoon of the 25th to start the temperature measurements that were needed to determine if an eddy was swirling slowly in our area. 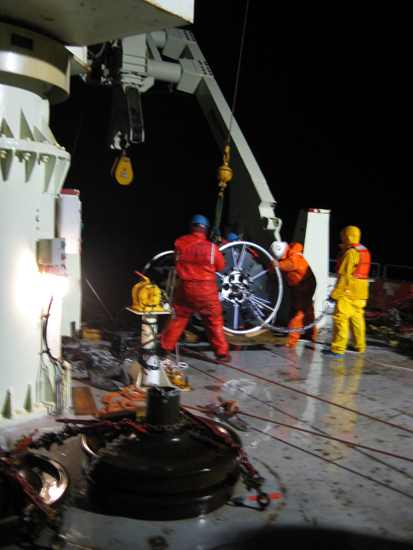 Every hour we deployed a small temperature probe called an Expendable Bathythermograph. But the warm water of the eddy core wasn’t showing up. Where was it? As the evening went on, I got more discouraged that we wouldn’t find an eddy, and I was feeling more and more seasick. As I finally went to lie down, I told the others to just keep moving and we would look for a different eddy in the morning. I was miserable in my bunk. I felt totally sick, my bunk was pitching around, and I could hear everything banging and clanging around as the ship rolled through the waves. I must have drifted off to sleep eventually—at about 0900, Jim knocked on my door and said it was time to start doing the eddy hunt again. I was feeling better (although the ship was still moving around a lot). Together with the others in the science party, we started again to look for an eddy with the temperature profilers. A lucky hit! Within about an hour, the warmer temperatures of an Irminger Ring showed up on the computer monitor. We took one more measurement to be sure, and then launched the float over the stern of the ship. As I write, we are anxiously awaiting an e-mail from shore that will tell us whether the float has appeared on the surface to make its first phone call with data. This particular float is called the “Perkins” float in honor of the Perkins students and their teachers. We have named it Perkins, the one float waiting here on the lab room floor. The conditions are not ideal, but it is time for Perkins to be launched! The team carries the float to the stern. Will and Jim put the float into position, then release it into the waves. This launch takes only a few minutes, unlike the hours the mooring deployment required. Hopefully Perkins will start to send information to Amy soon!